Universal Stand w/Casters for HT400/600, S-450/650 and SwingMan 20/25, N-880, R2R with additional purchase of adapter brackets models. All the above mentioned heat press models will work with the Universal stand but not all presses can be made threadable. Select spacer height size in shopping cart. NOTE: Only the HT400/600, S-450/650 are compatible for use with spacers and can be made into a threadable press. The Swingman 20/25, N880 and R2R cannot be made threadable. Stand height is 34" without the use of spacers. The Universal Stand can be fitted with ½”, 2 ½” or 4 ½” spacers, allowing for height adjustments to fit the operators comfortable working height. This also turns your heat press into a Threading press with a space below the machine to allow for shirts to be split so the operator can easily rotate between the front and back of the shirt without danger of damaging the images or color interference due to ink migration between the shirt’s front and back prints. 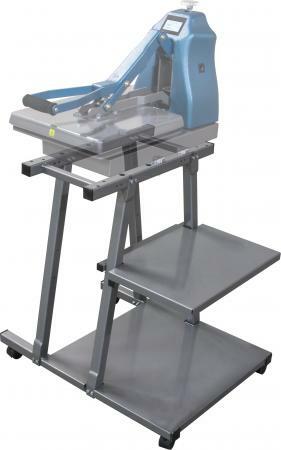 Aside from freeing up your workspace by placing the transfer machine on a dedicated stand, the Universal Stand also comes with two work shelves for shirts, transfers etc. For machines equipped with the EZ Glide Shuttle attachment, a special adapter kit (sold separately) comes with a third shelve. The Stand’s design is made to be robust and stable when working on the press. Casters easily lock to provide stability. Even with the SwingMan models the stand remains remarkable stable, even with the upper platen extended in the “away” position. With an EZ Glide Shuttle attached to an automatic machine (N-680 or N-880) and the special adapter kit installed (sold separately) the Stand remains stable when working on either side of the Shuttle. The Universal Stand is very mobile as it comes standard with casters which can lock when in position. This avoids constant manual moving of the machine because of work-space organization issues. To save on freight, the Universal Stand ships in knocked-down components with easy-to-assemble instructions and takes only 10 minutes to assemble!